A systematic approach to identify Business Model Innovation opportunities is to identify the different parameters that can be innovated upon, and the different principles for innovation. The Business Model Innovation Matrix is based on 40 principles to solve complex problems that were originally developed for technical inventions and published 1969 in the book Algorithm of Inventing, by Genrich Altshuller. The principles were a result of an analysis of 200000 inventions and has become a cornerstone in TRIZ. Now 40 years later the principles has been further developed based on the results of analyzing close to three million inventive solutions in science, arts, politics, engineering and business. 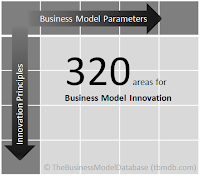 The Business Model Innovation Matrix consists of the 40 principles on the vertical axis and the business model components and the horizontal axis. As there is no dominant and widely accepted definition of the term business model I use the components below to explain the framework. If you prefer another business model template, with other components, you can of course apply the principles of innovation on that model. Often discussions on Business Model Innovation are limited to the improvement of value propositions. By creating the matrix with the 8 parameters presented below and the 40 Principles of Innovation I have 320 unique areas to generate ideas for Business Model Innovation. Value recipient - Who are we providing value for? Value Proposition - What values are we providing? Delivery - How are the values delivered? Assets, Capabilities & Activities - What internal and external assets, capabilities and activities are needed? External Relationships - What forms of external relationships are needed? Control Mechanisms - How is the value creation and extraction controlled? Benefit and Revenue Model - How are benefits and revenues generated? Costs and Harms - What are the costs and harms? Some combinations of principles and business model components are easier than others and I will exemplify with Principle 1 applied on each of the components presented above. When using Principle 1 - Segmentation the objective is to divide the business model parameter into independent parts, make the system or objects easy to disassemble or increase the degree of fragmentation or segmentation. Can we segment the value recipients into micro-niches? Can we go from mass market to mass customization? Can we provide value for sub-groups of the value recipient? Can we unbundle value propositions into different parts or modules? Can we move from one service level to several different service levels? Can we deliver the value proposition in parts? Can the value recipient be part of the assembly? Can we unbundle important assets, capabilities or activities into several smaller ones? Can we more effectively use the unbundled resources? Can we improve deployment of individual skills? Can we use flexible systems to respond to individual conditions? Can we go from one large partnership to several smaller ones? Can we go from one organization to a franchise concept? Can we control the value proposition by controlling parts of the value creation or value extraction? Can we control the value proposition by controlling the underlying assets, capabilities or activities? Can we divide the object for transaction into smaller parts? Can we divide the payments into smaller payments? Can we use temporary workers for the value proposition? Can we use short term contracts with external actors? Can we distribute costs and harms by diversification? Insourcing Innovation: How to Achieve Competitive Excellence Using TRIZ (2007) by David Silverstein, Neil DeCarlo, and Michael Slocum.